The University of Akron George W. Daverio School of Accountancy now offers its premier graduate tax program from the convenience of your computer, tablet, or mobile device. Candidates for this program who follow the recommended plan can complete the MTax Direct Program in as few as 15 months. The MTax offers substantive technical and professional knowledge and skills needed to excel as a tax professional. Although designed primarily for practicing accountants and attorneys, other professionals interested in a tax specialization will also find the program valuable. 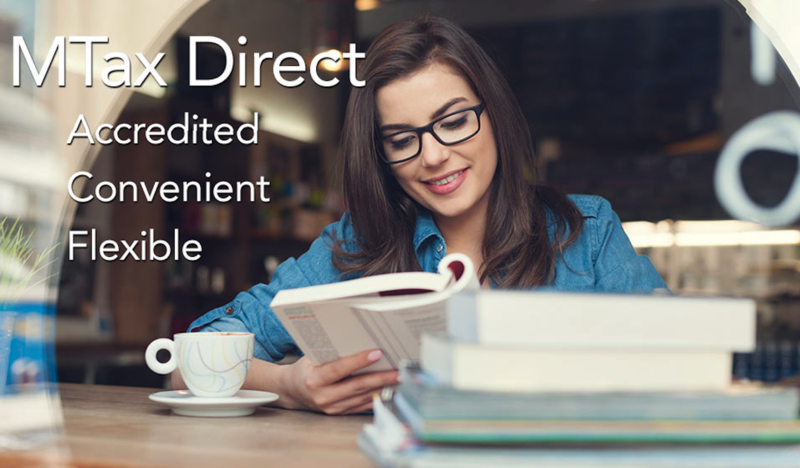 The MTax Direct program allows students to be off campus and participate in live classes. In case a work obligation or business travel conflicts with the live class, all classes are recorded for later review if needed. Convenience - interactive and delivered live to a laptop or mobile device, with capability of viewing recorded sessions on demand. Expert Instructors - highly experienced CPAs and attorneys with expertise in tax. Practical Emphasis - practice oriented, offering in-depth knowledge that can be applied immediately. Reputation - 30+ years of reputation for excellence among employers, and graduates are highly recruited. Flexibility - accommodates the schedule of tax professionals and customizable to focus on a specialized area. Efficient - may be completed in as few as 15 months. Admission to MTax Direct requires an undergraduate degree in accounting or a Juris Doctor (J.D.). Individuals without a degree in Accounting or J.D. may become eligible for admission by successfully completing two foundation courses (6200:601 Financial Accounting and 6200:627 Federal Taxation or 6200:531 Business Entity Taxation) before being admitted into the program. The School of Accountancy will offer those classes online. JD applicants without prior coursework in tax and accounting will be advised to take these courses prior to the start of the first term of the program. Attorneys and CPAs do not need a GMAT score for admission. Other applicants must obtain a satisfactory score on the GMAT for admission. Applicants may substitute a GRE or LSAT score for the GMAT. To apply, use Program Code 620022MT when you submit your online application. Because of the enhanced nature of this program, the live sessions do not follow the University’s traditional semester calendar, but are grouped into five 10-week terms (avoiding the tax season). Each class meets one night per week from 6 - 9:30 p.m.
Total tuition for the program is $25,000. This excludes tuition for foundation courses.